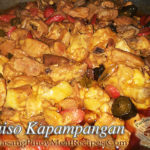 Pork afritada is a pork version of the well known chicken afritada. 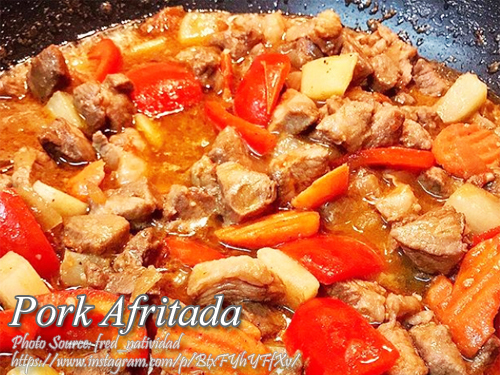 This is a very budget friendly dish because it has few and low cost ingredients such as pork, potatoes and carrots. It is also easy to make, and you only need a single pan to do the cooking. And with regard to the taste, you will find it tasty and filling because of the tomato based sauce like your favorite menudo or mechado. Although this dish resemble to menudo in ingredients and the cooking method, pork afritada ingredients are cut twice bigger than menudo. Heat cooking oil in a pan about 4 tablespoons. Fry the potatoes and carrots until slightly brown. Drain and set aside. In the same pan, saute the bell peppers for about half a minute then remove from the pan and drain. Set aside. In the same pan, leaving about 2 tablespoon of cooking oil, saute garlic & onion. Add the pork and saute for a minute or until lightly brown. Add the fish sauce and cook for 1 minute. Add tomato sauce and water and bring to a boil then add the pork cube. Cover and simmer for 45 minutes or until tender. Add the potatoes and carrots. Simmer until are tender and the sauce is thickened. Add the bell pepper and simmer for a minute or two. Season with salt and pepper to taste. Remove from heat and transfer to a serving bowl. Serve with hot steamed rice.